For anyone who has lived in Mumbai, it is easy to picture this. It is one of those hot summer months, and the sun is scorching hot. Getting out of the house seems like sheer torture. The only source of relief for us is the Nimbu Pani Wala ( Lemonade vendor) who is right around the corner. 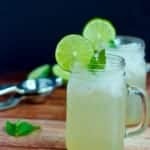 He would quickly squeeze a lemon, add some of his “magic mix”, ice and water and serve you this mind-blowing lemonade – both sweet and sour. This recipe for Nimbu Pani is my humble attempt to recreate that magic. 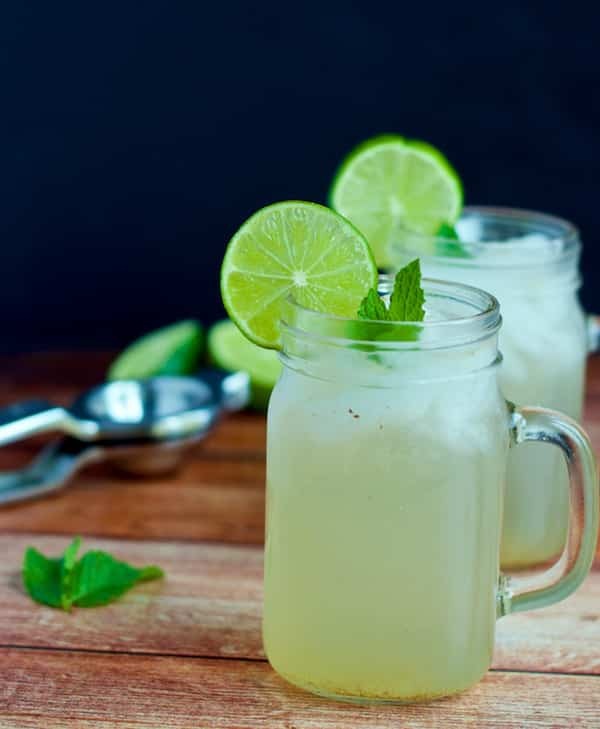 And if you haven’t had an opportunity to drink the sweet and sour Nimbu Pani, try this recipe and let me know via your comments on how you liked it. Lemonade may mean different things depending on where you live. In the UK, Australia, Switzerland, and New Zealand, lemonade apparently refers to a colorless, carbonated, sweet lemon-flavored soft drink. Whereas in India, it is mostly uncarbonated unless you ask for a lime soda drink. Is Lemonade made from Limes or Lemons? In India, limes and lemons are used interchangeably. You will find limes on every street corner but lemons (especially the large ones that we find in the US) are hard to find. That’s why in India, limes are typically used for Lemonade or Nimbu Pani. Add lime juice and sugar to a pitcher. Stir until the sugar has dissolved. Add the remaining ingredients (water, black salt, and cumin powder) and stir them until they are well combined.